This could be titled: “The Big Ask”! Shock, horror and repugnance- a nomilization! Surely wrong! Read below about conversions and nomilization and reactions to this. Illustration by Harry Furniss for Dicken’s Oliver. I’ve struggled teaching grammar- so many texts with mindless exercises that don’t seem to help student understanding. Students in such exercises are often marked right or wrong and in the end that’s all the students know- they were right here or wrong there but with no further clue as to why. In order to discuss writing, to analyze texts we need specific terminology. 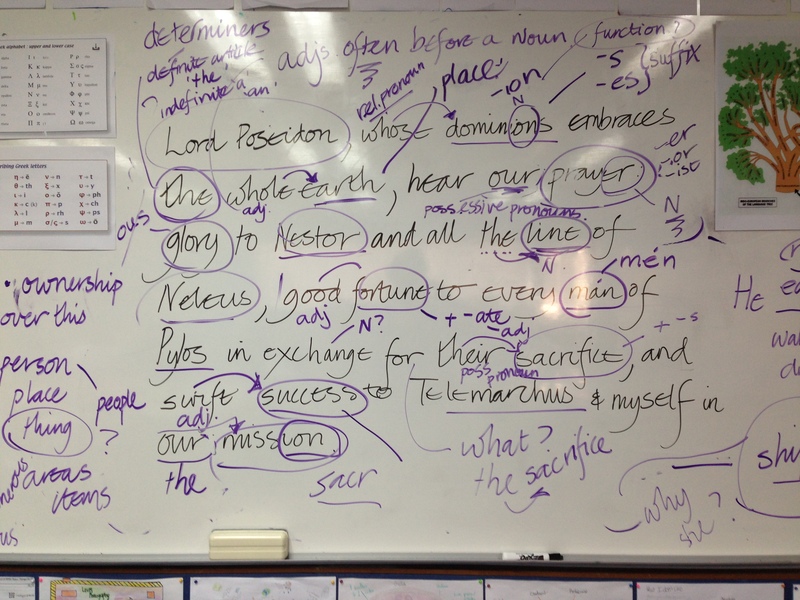 However, rather than just handling grammar as a labelling exercise, I wanted students, and myself, to have a deeper understanding about word classes …. and to be able to justify these. I began, for want of a better place, with nouns. We experienced this degree of ‘fuzziness’ in our noun-spotting. Yet paradoxically, this ‘fuzziness’ has deepened our understanding of nouns.We have had rich conversations, asked many more questions than found answers, and sparked a flutter or inquiries.We have gone beyond the rote categorization of ‘person, place or thing’ and in doing so struggled with the concept and functions of nouns. What makes a noun a noun? In response to this question, the usual statements are uttered that a noun is a ‘person, place or thing’. And this has always been my difficulty with grammar-labelling as it often limits and doesn’t really address ‘noun-ness’. I asked students to identify nouns in a piece of text from our graphic novel The Odyssey by Gareth Hinds. We examined the text carefully. Are there common features about the position of the noun in relation to other words? Are there morphological features in common? What patterns can we notice? Nouns, along with verbs, adjectives and adverbs are regarded as ‘lexical words’ the main meaning carriers, that belong to an ‘open word class’ . Why open? New entries to the language are constantly added to these word classes. In contrast the ‘closed classes’ are pronouns, determiners, prepositions and conjunctions as they are rarely added to.These words are known as the ‘function words’ and as such they have a structuring role in a sentence. When we ‘borrow’ words ( although appropriate may be a more accurate account) many are nouns. Hitchings writes that three quarters of the words absorbed into English in the period between 1250 and 1450 were nouns. Many of these of course referred to new discoveries- material things, experiences and attitudes. Nouns are always absorbed more frequently, whereas as the adoption of function words into the language is far more rare and indicates a deep connection with the original culture, an engagement with concepts rather than stuff. I recently learned of this through Gina Cooke’s brilliant course Old English for Orthographers where we saw that the adoption of ‘they’, ‘them’ , and ‘their’ from Old Norse revealed the extent to which the Vikings had integrated with the local population. Nouns are a vast collection. We have discovered that nouns are the most heavily populated of the word classes, outnumbering verbs roughly three to one (Jackson, Ritchie). Below, in bold, after much discussion, are the nouns we identified. ‘Lord Poseidon whose dominion embraces the whole earth, hear our prayer: glory to Nestor and all the line of Neleus, good fortune to every man of Pylos in exchange for their sacrifice, and swift success to Telemachus and myself in our mission’. Identifying the nouns and how we decide on their ‘noun-ness’ has led us into interesting waters. A record of our discussion, connections and questions. Thinking about language is messy; it’s more than an easy categorization. Names and places: Nouns can be names of people : Lord Poseidon. Some of us knew the term ‘proper nouns'( we did not go into the distinction between the term proper nouns and proper names, see here if interested.) Nouns as proper nouns also can be places, days and months. They are specific and refer to a particular place out of many, a specific day out of all the days, a specific month out of all the months and as such, they are marked by an initial capital letter. Yet this is not to us clear cut and we wondered about usage such as: ‘The December sun beat down on us’ . Is ‘December’ still a noun or is it now modifying sun and in that case an adjective? Or is it to be considered as one unit- December sun, a compound and in this sentence then a noun? Adjectives: The position in the sentence can give clues as to the function of a word. We saw that if there’s an adjective, it’s often, but not always, placed before the noun ‘the whole earth’, ‘good fortune’. Determiners: Nouns often, not always, have determiners before them : determiner + noun or determiner + adjective + noun. Determiners can be the definite article ‘the’ and the indefinite article ‘a’, ‘an’: ‘the line’, ‘the whole earth’. The possessive pronoun/determiner their occurs before a noun: so ‘their sacrifice’. Subjects and objects: Word order in English is important. Nouns plus words associated with them can be the subjects in sentences: Lord Poseidon,…. hear our prayer. Nouns can also be objects in a sentence: our mission, our prayer. Often in English, although not always, nouns and their phrases occur as subject, verb, object. Plural suffixes: Nouns can be plural- which is indicated often, not always, by the inflectional suffix <-s> and <-es>. We saw that if we substituted the plural form for the singular and it made sense, most likely it was a noun so < prayer+s>. ‘Sacrifice’ we knew could like many nouns, be used verbally. However, with the adding of their before sacrifice and testing with the plural suffix <-s> helped us determine that sacrifice here in this text, was functioning as a noun. Cases: English nouns in the present day have lost many of its cases but can mark the genitive case through <‘s> in the singular and usually <s’>in the plural: ‘Poseidon’s wrath’, ‘the suitors’ greed’. The derivational suffixes: The suffix <-ion> is a huge clue as to ‘noun-ness’ : dominion, mission. But we also noted words like function, station which can be used verbally: I function well as a team member or I station myself by the door to welcome guests. The agent suffixes: The derivational suffix <-er> can indicate that a word is a noun. It can convert a verb to noun so the verb pray becomes a noun <pray+er> the words that pray, request or beseech. <-er> can be an agent suffix, agents being people or objects that do something. We discussed other agent suffixes such as <-ian>, <-ist>, <-or>. We’ve now started a list of words with these agent suffixes. Many nouns can swap word classes for example words that are adjectival can often be used nominally: ‘the swift and the nimble will be rewarded’, ‘the long and the short and the tall‘, ‘the good, the bad and the ugly.’ We discussed how verbs can be converted to nouns by adding the suffix<-ing> creating a gerund: Running is a favorite sport in our class. We also talked about further dividing nouns into abstract and concrete, count and uncountable and noting interesting features about them. Do abstract nouns take plural suffixes? We tested this and with these words thought ‘no’, *happiness+es, *laughter+s, *luck+s *anger+s… but then joy+s is possible: ‘The joys of teaching are numerous’, Freedom+s is possible: ‘the promotion of universal respect for and observance of human rights and fundamental freedoms’ (UN Preamble Declaration of Human Rights). We wondered about <*justice+s> – it does not seem possible to add the plural suffix here unless you are referring to people who are justices yet its opposite <in+justice+s> is possible. Is <-ous> always an adjectival suffix ? What are other ways of forming the plural suffix? We know child~ children so <child+ren>? <childr+en>? Read here about the double suffix indicating the plural! What about brethren? The singular is not *brether but we wondered about brother and lo and behold thanks to ever reliable Online Etymology Dictionary, we found our answer! What other words have <-en> as a plural suffix? When it looks like a plural, is it? Why are some nouns marked with an <-s> even when we are talking about a singular item – trousers, pants, undies and boxers. We don’t say trouser, or pant or undie in reference to one of the aforementioned items. We use these words for both the plural and singular. We made a list of such examples adding: scissors and binoculars. One student mentioned that we say ‘a pair of trousers‘, or ‘a pair of scissors’. Is it it, we wondered, because there are two parts to the unit that we say scissors even when speaking of just the one object? Is this the reason for pants and trousers, boxers, knickers and undies? All have two leg holes. However, why not this logic with other garments? We have both singular shirt and plural<shirt+s>, singular jumper and sweater and their plural counterparts <jumper+s> and <sweater+s>, a singular <cardigan> and the plural <cardigan+s>. All these items have two holes, sleeves! Or is the <s> part of the base element rather than the plural suffix<-s>? Usually we avoid this confusion by the final non-syllabic <e> so not *hous but house, horse not *hors. We are intrigued and looking for more examples. Why no gender? We discussed that in English, nouns, unlike many other languages are not categorized by gender. Some German, French, Korean, Chinese and Italian students compared their languages with that of English. English, as Ritchie reminds us, ‘binned the masculine, feminine and neuter gender groupings of its Anglo-Saxon days’ and lost almost all the different forms its nouns had. Is <th> in the final position of a base element a clue that a word is a noun? Are words with a <-th> suffix nouns? Are they all from Old English? One student asked this after noticing <strength> in the passage above. She wondered about its connection to <strong> She has has become intrigued by this and is rapidly gathering data. Stay tuned! What’s wrong with conversion? Why do some people get so irritated by using verbs as nouns. I thought I sided with descriptivists, linguists who describe the language, rather than prescriptivists, those who decry various usages attaching ‘rightness’ and ‘wrongness’ to various utterances. However, a secret hate has been the nominalizing of ask. I had assumed this use to be a recent development, perhaps more frequent over the last 8 years. I noticed its popularity with sports commentators. Often I’ve heard that “it was big ask” to convert a particular try in the noble game of rugby and winced. Imagine my surprise when I checked the O.E.D. and discover it has been attested as a noun from 1000 CE!!! : Laws of Athelstan: Hæfdon ealle ða ǽscean, again in 1230 an example: ‘He failed of his as‘, again in 1781: ‘I am not so unreasonable as to desire you to..answer all my asks’(Twining)! I also discovered a ‘Draft Editions Entry, 2005′ in the OED stating:colloq. (orig. Austral.) (chiefly Sport). ‘With modifying word or phrase, as a big (also huge, etc.) ask : something which is a lot to ask of someone; something difficult to achieve or surmount’. Noun-spotting, not such a big ask! We’re now seeing them everywhere and classifying them according to our observations. And what of the word noun itself? A noun of course, attested in English in the 14th century from Anglo-French, from the Latin root nomen: name! Old English also used name to mean noun. (Online Etymology Dictionary). We are actually looking forward to exploring verbs! Oh the clamour for the glamour of grammar!